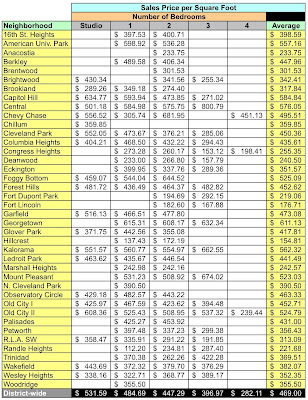 I thought it would be interesting to see how much a District condo costs on a per square foot basis in each District neighborhood. Moreover, does sales price per square foot increase or decrease as the number of bedrooms increase? So, I pulled data for 2008 condo sales [January - May] and, after deleting those sales for which I had no information on sales price per square foot [usually because the condo's CAMA data aren't available through the District's public websites], plopped it into an Excel pivot table. See the table below. In the aggregate, sales price per square foot decline as the number of bedrooms increases. Obviously, there are exceptions, but in general the rule applies for each neighborhood, too. Interestingly, the most expensive condo sale on a $/sq ft basis in Old City II was a 419 square feet studio that sold for $942.72/sq foot. From where do you get the neighborhood categories for tables such as this one? Those are the neighborhood names used by the District's tax office for appraisal purposes. Each sale is recorded with its appraisal neighborhood name; it's easier for me to go with that than try to determine whether a home/condo is in Dupont Circle, Adams Morgan, Penn Quarter, NoMa, Shaw, Logan Circle, etc. Is there a map where we can find where the neigborhood names superimposed? I looked at the DC tax office web site once, and couldn't find one. I think it makes sense. Incremental square footage prices decline because you start reaching limits on what people can afford. The exception to the drop in square footage prices after the 2nd bedroom are all in pretty predictable locations: Georgetown, Kalorama, Old City II (Dupont/Logan), Central---all locations where 2+ bedrooms are historically in short supply and you're probably limited to rowhomes in the most sought-after locations. The biggest outlier is Trinidad! There is a huge spike from 2 bedroom to 3 bedroom square footage prices. I have to imagine that the data is skewed by the sale of some mansion near Gallaudet or something. Exactly. Having just bought a 1br in Columbia Heights, I can tell you the math. You can buy a 1br in the hoods you want, or a 2br in sketchier ones. In this case, a move to Petworth, for a large 2br in a hood where my guests would be potentially mugged. So 1brs will hold value long than 2brs, as in every case, folks will usually trade up location for the luxury of the extra room. Well, I'll tell you. I once found that map, may even still have it, but I'll be damned if I can find it on DC's web site today. What a mess. Maps all over the place: planning, transport, zoning, main site [but it's dead], GIS. A complete kludge. OK, it appears the District has moved the neighborhood assessment map to a KMZ file, which can be displayed by Google maps. I'm making it available at this URL. Keith, you totally rock! Thanks for your amazing work. Thank you, Keith. This is pretty interesting. Great work. Hey, would you mind putting the link to the neighborhood map somewhere handy on your blog? Smaller units will often cost more money per square foot. Each unit has certain sunk costs that will cost the developer the same amount of $$$ whether the unit is 760sf or 1020sf. These include the appliances, bath/kitchen finishes, HVAC, water heater, etc.. Adding a den or a 2nd bedroom is usually just increasing footprint and sheetrock. So if person A buys a 760sf 1BR condo at one building for $372K ($489/sf) it does not mean they got gouged simply because another much larger 1BR condo went for $458/sf down the street. Boiling everything down to $/sf is a useful tool but it's still a crude one and only part of the picture. Not sure "sunk cost" is quite the right term, but I get your point. I'm not implying anyone is getting gouged... well, maybe I am since my $108K condo, an apartment conversion from the 1980s with thin walls [don't have fun in the shower if you don't want to be heard! ], which I sold in 1993, is NOT worth the $400K people want today... But that's another story.